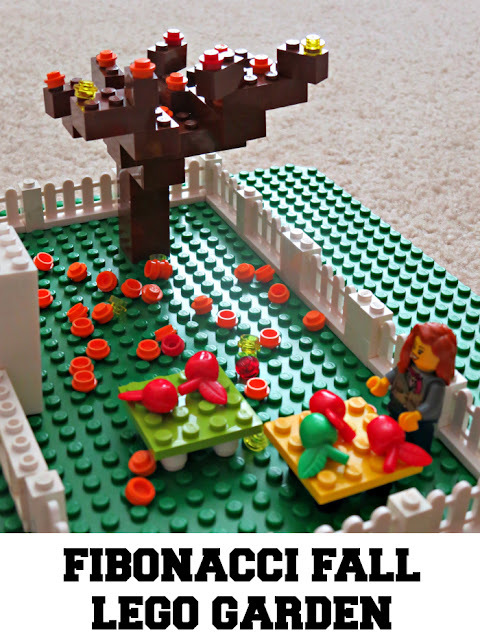 Fall is around the corner and we decided that it's time for another Fibonacci LEGO garden - this time it's a Fibonacci fall LEGO garden. Smarty learned about Fibonacci sequence when she was in the first grade, and "challenge group children" were given a problem to figure out what comes next in the sequence, 1, 1, 2, 3, 5,... She always found these problems fun, and she was thrilled to learn that this particular pattern, where the next number is produced from the sum of two previous numbers, has a special name - Fibonacci sequence. 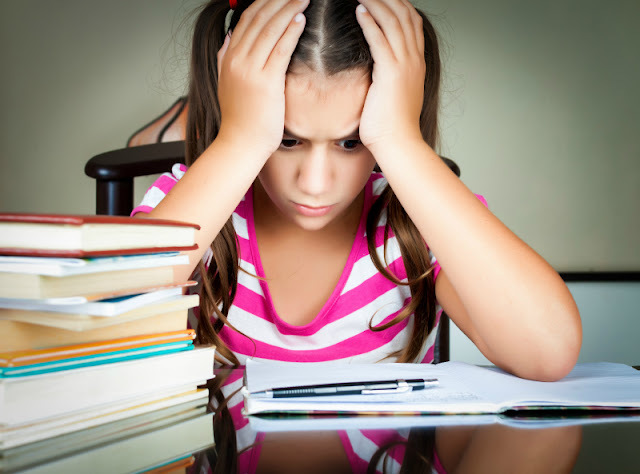 Later, she learned that Fibonacci sequence is not just mathematical - it's widely encountered in a natural world. 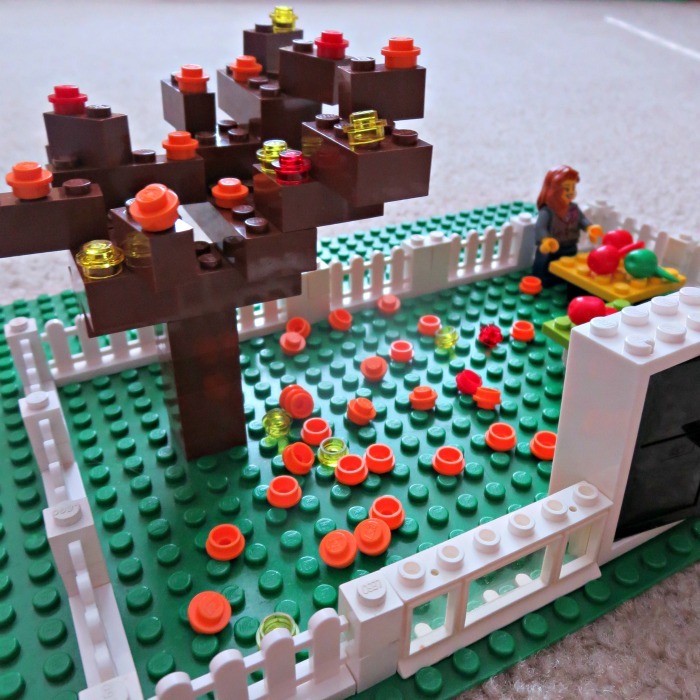 We used our vast "loose bricks" LEGO collection to build our garden. We used 1 LEGO plate, 1 LEGO mini figure, 2 "table tops", 3 pieces for the garden entry, 5 apples (I think they came to us originally with LEGO farm set), 8 "table legs", 13 fence pieces, 21 brown pieces of various sizes for the tree, 34 white 1x1 pieces for fence posts and 55 multicolor "LEGO dots" for leaves. Now build your fall scene from your imagination. I think it turned out great this time - I like the twist of scattered "leaves". More Ideas about Fall and Leaves? 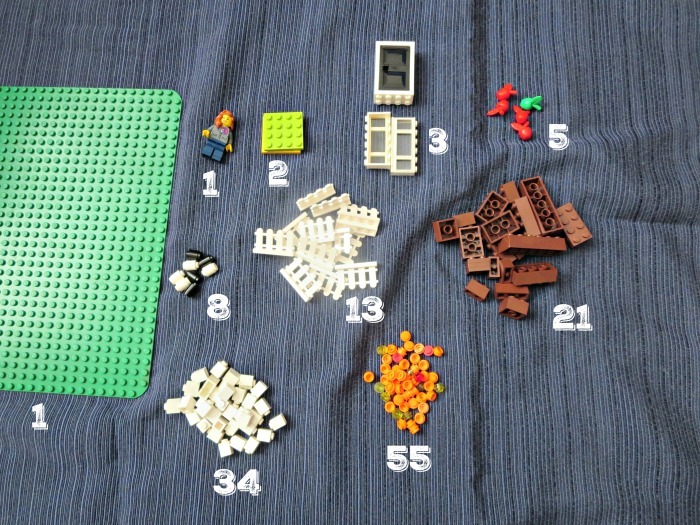 Leaf Activities for Kids from Look! We're Learning! I love it, and what a great take on a Fall activity.